It is the long weekend before the start of school and many of us are doing the last minute or left until the last minute back to school shopping. If you have younger kids and school is anything like how they do it around here, you really do not need your school supplies for another week….so you still have a ton of time to get those items the little scholars want and need. Don’t rush out and just get something for the sake of being done, buy smart and buy items that will last. 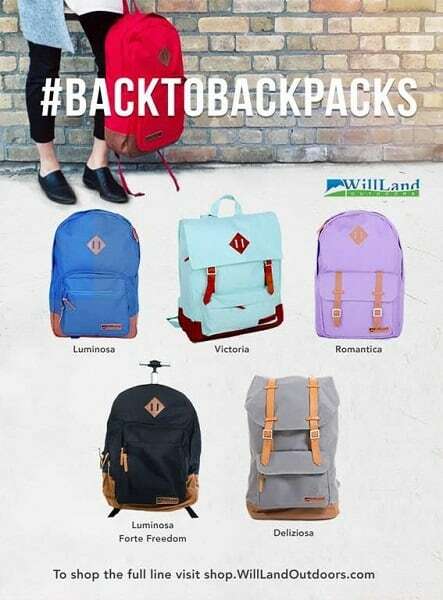 For us, WillLand Outdoor backpacks provide the perfect variety of styles, features, sizes, colors, and quality to keep us going long past a school year with a backpack. We actually first got introduced to WillLand Outdoors and their backpacks when I did a review for Kelloggs. Our back to school review products came in a WillLand Outdoors Dark Grey Luminosa backpack. We loved this backpack and it is still in use a year later, looking brand new still. My Little One needed a newer color backpack so she decided on a Luminosa Light Aqua backpack for this year. 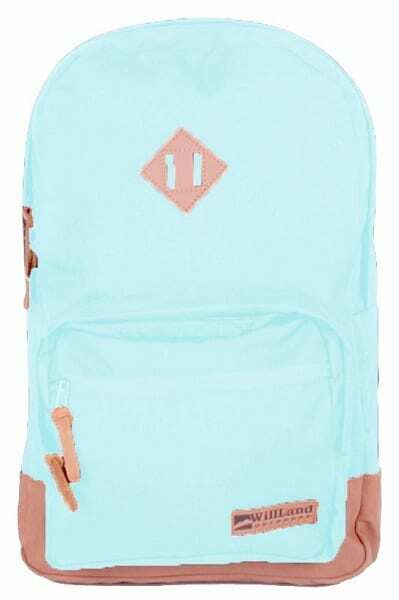 This backpack is perfect for a day at the college. Students these days are burdened with so many textbooks that only a bag this size can fit it all. Having two backpacks is perfect as we now have the school designated backpack and the going to my grandma’s and grandpa’s house for a sleepover or any other event backpack. I find that the Luminosa backpacks are a good size for smaller backs so that they carry just what they need without a ton of weight on their back. Here is more about WillLand Outdoors and their company and backpacks……. Canadian-designed WillLand Outdoors is ready to get you geared-up in style for the fall! Whether you are headed back-to-school, back-to-work or on an action-packed adventure around the world, WillLand Outdoors has got your back! Designed for those on the go, with unique features like built-in laptop sleeves, padded back support and magnetic closures, WillLand Outdoors is the perfect staple to ensure you are always equipped for wherever life takes you. With a large variety of fashion forward styles, fabrics and colours, there is a WillLand Outdoors backpack to suit any fashion personality. Whether you’re sporty, chic, simple or bohemian –WillLand Outdoors has a backpack to accompany you on your next adventure, wherever that may take you! WillLand Outdoors is available for purchase at shop.WillLandOutdoors.com. The perfect travel companion for the occasions when a standard sized backpack just isn’t enough. The Deliziosa is designed for the true adventurer, who is always on the go. Navigate with ease – this versatile, convertible backpack is designed to carry just about anything! Built-in-wheels and large compartments make it ideal for travel and commuting. Since 2012, WillLand has brought high-fashion street-style to ready-to-wear backpacks, bags and accessories. Created with a firm belief in providing Canadians with easy-to-wear and high-quality bags, WillLand’s unique product portfolio includes two distinct lines – WillLand Outdoors and WillLand Selection. The WillLand Outdoors line features outdoor gear, bags and backpacks built for the Canadian adventurer. The premium WillLand Selection line puts a modern luxury spin on classic bag, tote and backpack designs. WillLand believes that modern luxury should be made ethically. Since its inception, WillLand has risen to be at the forefront of ethical manufacturing practices and received certification from the Fair Labor Association and Live Green Toronto. For more information or to browse and shop, visit shop.WillLandOutdoors.com and shop.WillLandSelection.com. We love our WillLand Outdoors backpacks and I love browsing the entire lineup of products that they carry. Whether you are back to school, traveling, camping, need something waterproof, or just need a stylish bag, I suggest that you check out WillLand Outdoors. I have two this up next on my wish list and they are the WillLand Selection 160725 Tote with Strap and the WillLand Outdoors Snowshoes Set.